It's been a long wait, one that included interesting theories about the name and strange media embargoes but we finally have the road test of Mahindra's new Gusto and it's been one of the more pleasant surprises we have had in some time. Mahindra gave us another black Gusto for our test here in Mumbai but we figured we'd use the same pictures from our first ride - rural Jodhpur looks so much nicer! What I like most about the Gusto is that it is an interesting and fairly unique looking scooter but it's not garish or overtly attention grabbing. The scooter is covered with strong lines especially in the side profile. The rear end is the best looking angle in my opinion, and perhaps it's just me but I see a hint of Aston Martin in that tail lamp design! In comparison, the front end gets a safe and slightly boring design that doesn't really gel with the rest of the scooter. The pilot lamps and faux grille add some character but that headlamp looks like it could have come off any number of scooters available today. The LED position lamps do add a bit of flair to the front end but the Gusto does have a rather generic front end. Which brings us to the name. 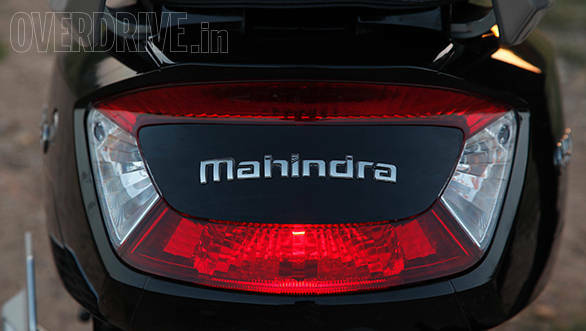 Mahindra say that they expect the Gusto to be a breeze of change for them, a gust of good business if you will. And that's the reasoning behind the unusual name. After having ridden it thoroughly we don't think their optimism is unfounded. 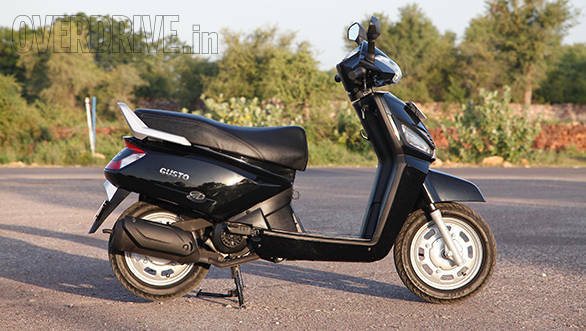 Simply put, the Gusto is the nicest scooter built by Mahindra to date, both in terms of engine and chassis. Contrary to some reports, the engine is all new and almost entirely constructed out of aluminium. 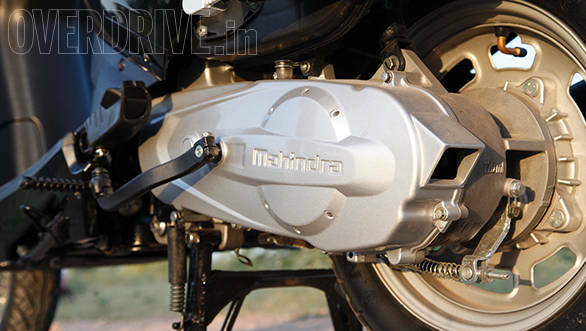 Mahindra say they've given it a stronger crank and bearings, a high energy ignition coil and a high venturi carburettor  all in the name of strong but mainly stress free performance. Christened the Mtech, it displaces 109.6cc and produces 8.2PS and 9Nm, figures which put it at the higher end of its segment. But then the Gusto has a kerb weight of 120kg which makes it considerably heavier than its rivals. Thumb the starter and the Gusto fires up without complaint and settles into a smooth idle with faint vibrations in the mirrors. It sounds and feels very similar to a Honda engine at idle, which is pretty high praise. On the move, what impressed me most about the Gusto was its refinement  the small vibes at idle disappear once you set off. 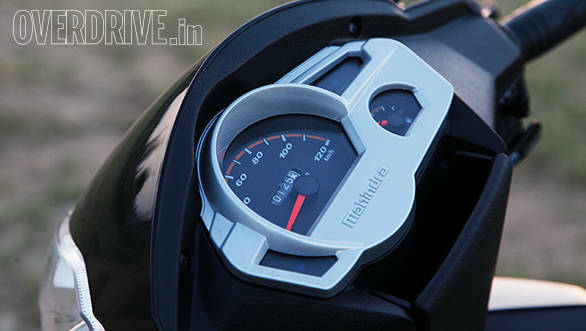 The throttle is smooth and doesn't have that initial tendency to launch the scooter ahead that we've seen in older Mahindras. The Gusto feels unstressed and reasonably quick. It doesn't build speed quite with the pace of the Suzuki Let's but it feels happy and stress free at a sustained 60 to 70kmph. The Gusto is decently quick taking 12 seconds to 60kmph before topping out at 85.3kmph. It's also pleasantly efficient, returning 62.5kmpl on the highway and 58.2kmpl in the city for a combined figure of 60.25kmpl. Also very impressive is the Gusto's ride quality. Previous Mahindra scooters were very softly sprung in an attempt to be comfortable. The issue with this is that they bottom out quite easily with a pillion on board or if you hit a bump fast enough. Not so on the Gusto, with its new telescopic forks and firmer rear spring. 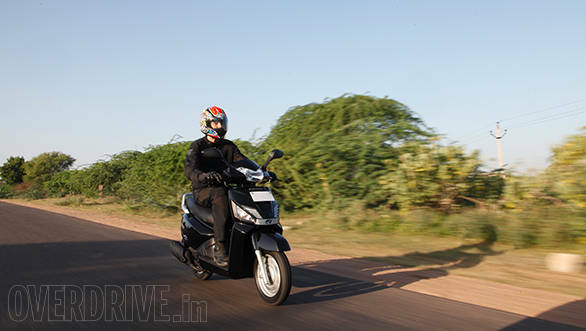 It has a nice, taut feel that doesn't get upset even through sharp potholes or speedbreakers. Large 12-inch steel wheels with 90 section tubeless MRF Zappers and one of the longest wheelbases in class (1275mm) further add to the stable feeling. Whether it's traversing bad roads, jumping speedbreakers or leaning through corners, the Gusto feels stable and enjoyable. The seating position is pretty comfortable as well, accommodating enough for tall riders like myself but with the potential to feel confident to shorter riders as well. That's thanks to the smart height adjustable seat that Mahindra have devised. It's a rather complex system where by you can raise or lower the seat height by a difference of 40mm. The system involves twisting a knob which drops the seat support up front to lower the seat height. Raising it requires a twist of the knob along with a pull of the seat support. It's easy to use and takes little effort to operate. Mahindra have also engineered the seat to open backwards to facilitate this system. 40mm is quite a bit and I found that it was comfortable for me on the higher setting while shorter riders preferred the lower position. This should definitely be popular in households where riders of different sizes intend on sharing the scooter. The seat, while plush, isn't overtly soft like in some of Mahindra's previous scooters and that's a good thing as well. You can see that Mahindra have listened to the feedback they've gotten from customers and the media and that reflects in the new Gusto. The Gusto runs twin 130mm drum brakes which offer adequate performance but not the best feel. The levers feel quite hard and wooden and require a bit of a pull to produce strong braking performance. Considering that the Gusto will be sold in international markets, you can expect a disc brake option somewhere down the road. Overall performance is good though and we managed to get the Gusto to a dead halt from 60kmph in 18.7 metres. What Mahindra Two Wheelers have always prided themselves with is the amount of features they offer. The Gusto gets quite a few interesting features beyond the trick adjustable seat. Of them, I really liked the reverse style kick-start that extends towards the front of the scooter, rather than the rear as in most other scooters. This lets the rider start the scooter without having to put it on the main stand, something that the ladies will quite appreciate. The rear footpegs have a small extension of soft rubber so as to not hurt the back of the riders feet while paddling in traffic with a pillion on. 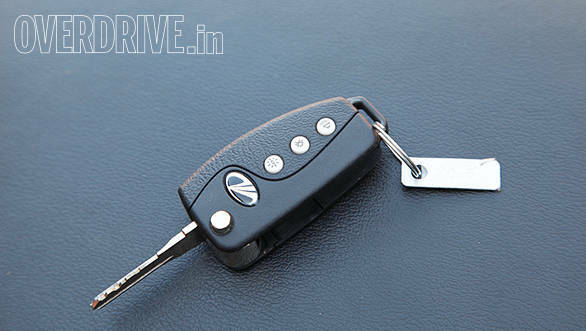 And then of course you get Mahindra's car-like flip key with a find me and follow me system. There's also a small open storage compartment under instrument cluster although I wouldn't store anything of much value in there for fear of it sailing out when you hit a pothole hard. The rear brake gets a locking clasp while there are two bag hooks, one under the front seat and one on the front apron. Honestly, there isn't much missing on this scooter, perhaps with the exception of the option of a front disc brake. The Gusto is available in two variants. 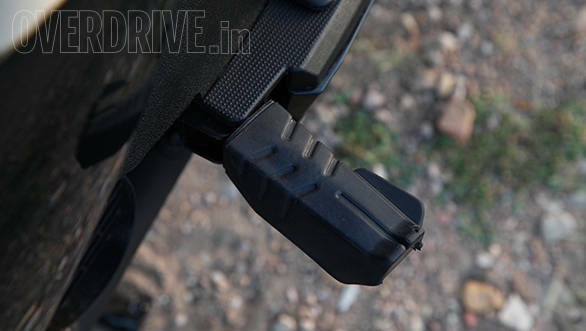 The top end VX variant gets all the features I've mentioned above and costs Rs 47,000 ex-Delhi. For Rs 4,000 less you can have the base DX version which gets a fixed seat height (set between the max and min position) and a standard key but retains the reverse kick, LED position lamps and soft footpegs. That puts the DX almost equal to rivals like the TVS Scooty Zest, Suzuki Let's, and a good Rs 3,600 less than the Honda Activa. This also puts the Gusto squarely in the middle of a rather competitive market. Its a genuinely enjoyable scooter to ride and a big step ahead for Mahindra. They are now more equipped to take on the competition than ever before.